We are one of the prominent Food Tray Serving Trolley Manufacturers in India widely known for our dedication to our work and customers alike. Using the best materials acquired from well known vendors we make it a point never to compromise on quality and manufacture products that low on maintenance, user friendly and high on performance. Our Steel Food Serving Trolley is highly in demand all over India due to its durability, strongly built features, portability and ability to keep maximum items without any mess on it. 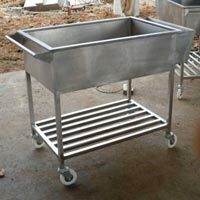 The food serving trolley that we manufacture is highly on demand in various hotels and domestic purposes all over India for its stylish steel finish and varied designs.